A new invest has been designated to the east in the basin, out near the Marshall Islands. Guidance isn't particularly excited about the invest at the time, but it does appear that it is beginning to be picked up in the solutions. I think chances are decent that it could develop into at least a tropical storm as it moves to the west towards the Marianas. Last edited by 1900hurricane on Tue Sep 13, 2016 5:31 pm, edited 5 times in total. 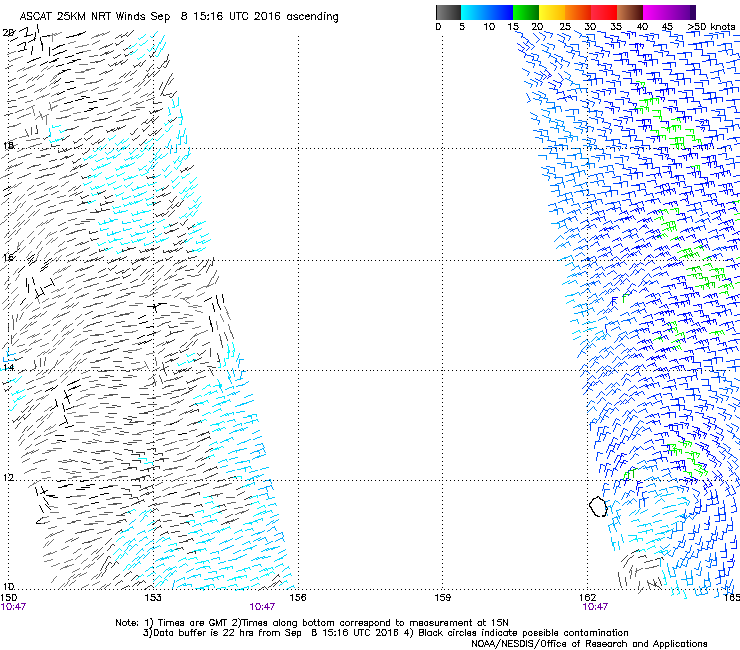 ASCAT shows a weak circulation with 90W. 11.5N 162.6E, APPROXIMATELY 338 NM EAST-SOUTHEAST OF KAWAJALEIN. KNOT) NORTHERLY VERTICAL WIND SHEAR AND WEAK EQUATORWARD OUTFLOW. 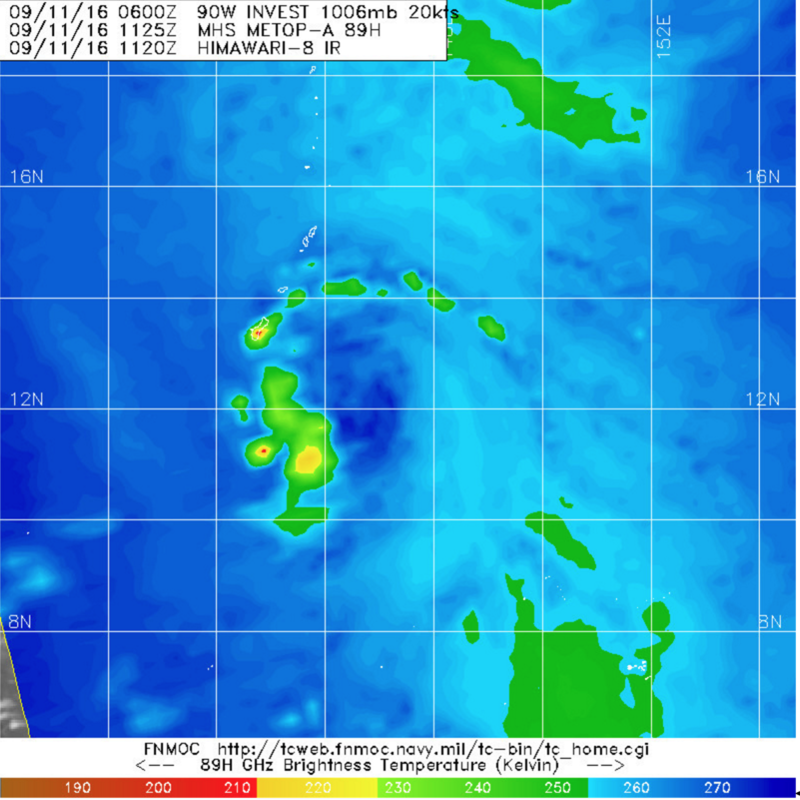 NAVGEM takes a weak wave through the middle portion of the Marianas. CMC takes a possible typhoon to Guam then devours Okinawa. EURO suddenly dissipates this with little to no strengthening west of Guam and gets swallowed by another storm. 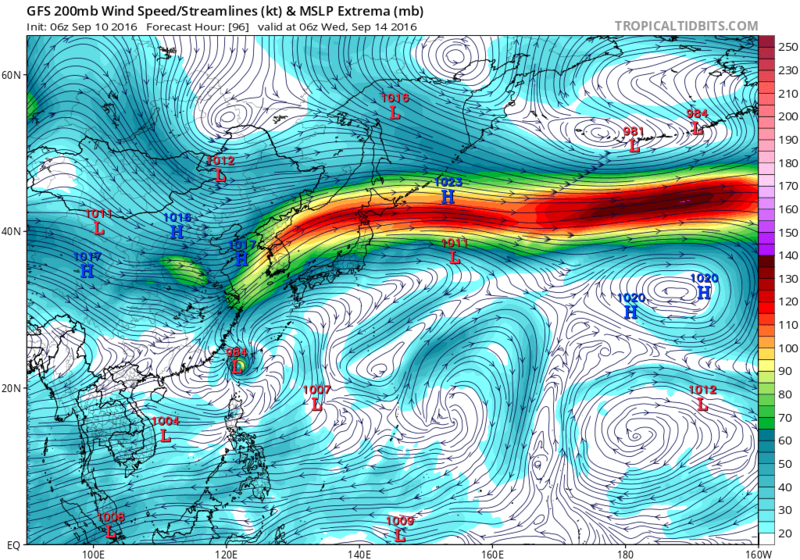 GFS bottoms this to 929mb and landfalls in Japan yet again...Honshu. have to up the showers if this kind of agreement keeps up. I am somewhat surprised to see JTWC go with medium today since there's still so much organization that needs to happen for this to have a hope of classification. If you squint really hard at the latest microwave pass, you can maybe make out some very shallow banding on the east side...maybe. At least in the GFS's case, the solutions have kept 90W following Meranti too close and having it nailed by an outflow channel. It may take a Meranti landfall for 90W to get going. 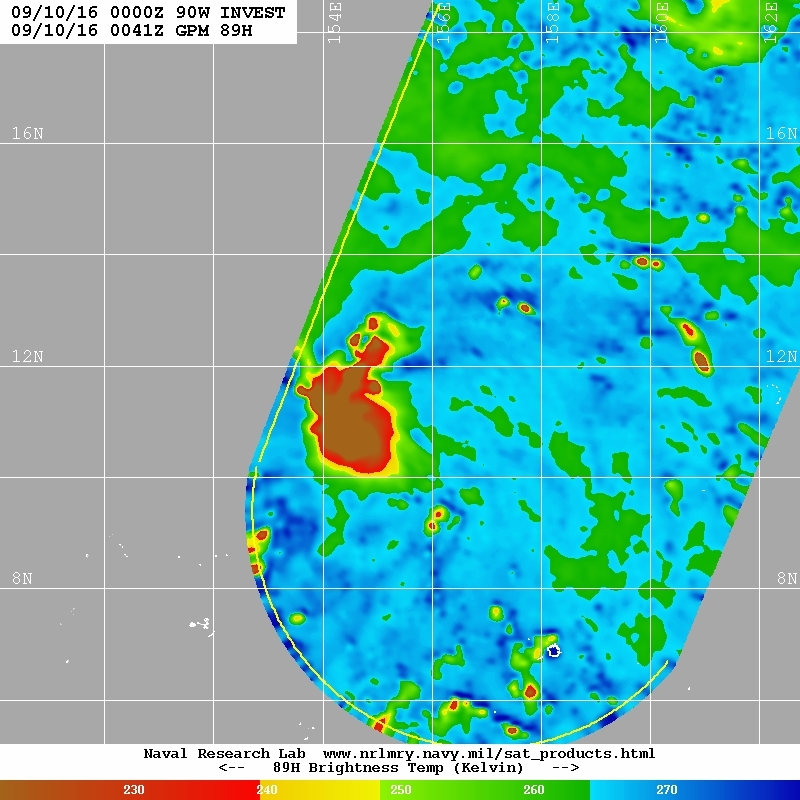 Visually though, 90W does appear better organized now than 12-24 hours ago. JTWC's medium is much more realistic now in my opinion. resulting in thunderstorms through the end of the week. WESTWARD TO WEST-NORTHWESTWARD TRACK WITH SLOW DEVELOPMENT. Tropical Cyclone Formation Alert is now up for 90W. NEAR 12.3N 146.1E. THE SYSTEM IS MOVING WESTWARD AT 12 KNOTS. WAS MOVING WEST AT 14 MPH WITH MAXIMUM WINDS OF 15 TO 20 MPH. POSSIBLE. WIND GUSTS OF 20 TO 30 MPH ARE POSSIBLE IN HEAVY SHOWERS. AT WWW.PRH.NOAA.GOV/GUAM/ (ALL LOWER CASE). 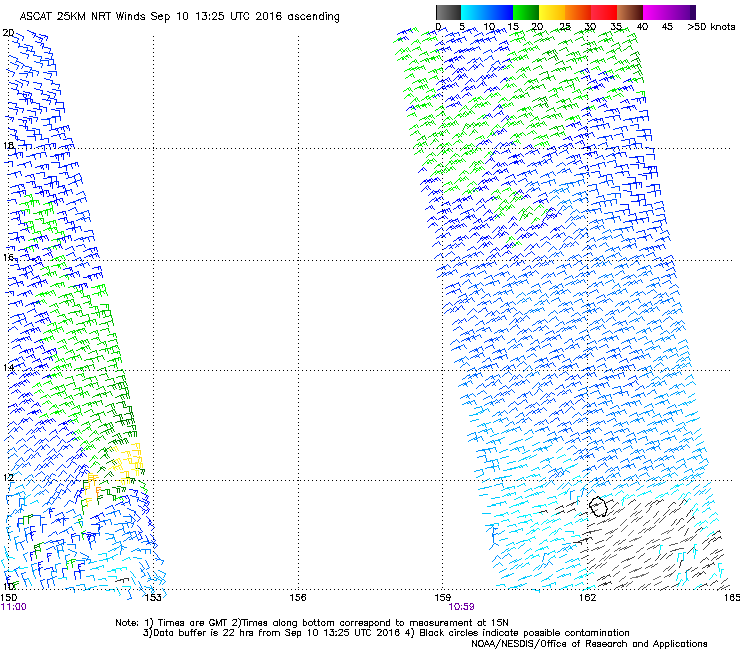 Guidance has been progressively getting stronger with 18W as it passes east of Taiwan. JTWC actually looks like they want to stay ahead of that trend. I haven't gotten a chance to see how favorable environmental conditions will look around that time, but it probably won't be too drastically different than what it looks/will look with Meranti, especially since 18W won't have to deal with Meranti's outflow like it is currently.